Ultra Electronics AEP has expanded its mobile security solutions to now protect text messaging with TrustText for smartphones. 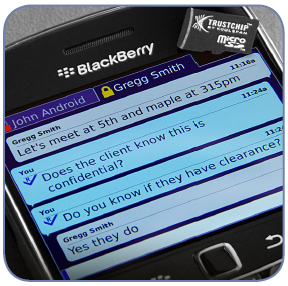 TrustText encrypts and decrypts SMS text messages across GSM and CDMA networks. AEP’s solution combines an easy-to-use application with a tamper resistant microSD encryption card that can be remotely managed. The end result is a powerful encryption solution for CUI SMS transmissions. Whether sending or receiving the message, TrustText provides the best in security strength and operational flexibility anywhere that mobile service is offered. Being assured of end-to-end security from the originating smartphone, through the network, to the destination device – regardless of any vulnerability in the underlying networks. What’s more TrustText guarantees delivery notification of SMS texts as well as notification whether or not your message has been viewed by the recipient for added convenience and reassurance. Short Message Service (SMS) communication is an effective method to quickly relay critical or sensitive information in a brief, succinct text message. This invaluable form of communication can positively impact the daily operations of all market segments (commercial, military and public safety). While SMS security is adequate for most open communications, it does not provide secure transmission for Controlled Unclassified Information (CUI) level messages. SMS security is limited to the cellular networks that it travels across: Global System for Mobile Communications (GSM) or Code Division Multiple Access (CDMA). Both offer limited security protection to adequately prevent information from being exposed. As the mobile workforce expands at an unprecedented rate, so too does their reliance on smartphones to stay connected and productive. To ensure the safety of their SMS communications, enterprises must make mobile security requirements a top priority. TrustText delivers an intuitive user interface with advanced application features and the industry strength of the TrustChip encryption solution. This hardware anchored solution transforms smartphones and networks into a secure communications infrastructure for SMS communications. With the goal of minimising cost and risks, AEP can install the highly scalable and rapidly deployable TrustText in most client environments in one day. An organisation can choose from either a turnkey hosted offering or a lightweight private installation – whatever best fits the need. Either approach will provide companies with easy-to-configure features rich and enhanced security capabilities for the TrustText solution. 2004 yılından bu yana Hosting firmalarının da tercihi olan Ankara lokasyonlu Sunucu Merkezi ile profesyonellerden profesyonellere hizmet veren firmamız kendi müşterilerinin sektörlerinde faaliyet göstermez. Profesyonel ekibinin tecrübesi, altyapısı PCI, TSE ve ISO sertifikaları ile tescillenmiş kalitesiyle Türkiye'de konusunda en yüksek standardın referansı haline gelmiştir.